Jillian Undercover: Sheena and David's Engaged! What I did yesterday after work? Witness one of my oldest friends switch statuses to being engaged! 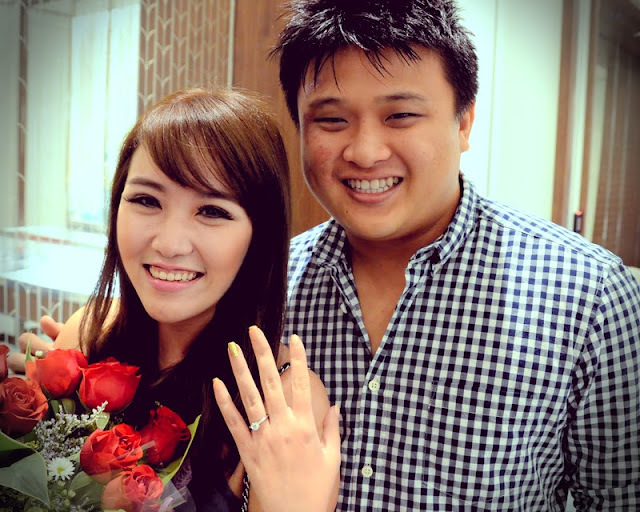 Michiekins, the mastermind of the day, had plotted several events to trick the bride-to-be into believing that she was in fact going shopping before heading for a birthday party, while the rest of us waited with her now fiance at Tiffany & Co. at KLCC. The plan was that Michiekins would lead Mama Pea (as she is affectionately known to me, because I'm her Sweet Pea) into Tiffany & Co., to 'look around'. Her fiance and the rest of us were to wait upstairs with the whole shebang - balloons and all! "Okay, she's coming now. Everybody be ready. Oh wait, Michiekins just texted, she's gone for a smoke"
Random human silhouette passes by and we all hold our breath. Oh wait, not her. In any case, the whole plan worked and it was a great success! Mama Pea and I go way back. We met and became friends at the age of 6 and have been very close ever since. We've gone through good times and bad times and I am so pleased to be a part of this significant moment in her life. Mama Pea, I couldn't be happier for you! I'm so happy you have finally gotten what you've always dreamt of. Here's to a new beginning for you and David. Congratulations!